This 6′ piano was built by John Broadwood and Sons of London UK in ~1870. Termed a Cottage Grand, i.e. suitable for a British country home, it has 82 keys (C to A, or lacking the lowest and highest three keys on modern pianos) and the mechanism found in the typical English grand of the 19th century. This type of action pre-dates the Errard double-escapement which was developed into the action found on modern grands. Other details include agraffes for all notes, single termination stringing throughout, conventional over-dampers and 8.5mm key dip (modern key dip is 10mm). During the 19th century the piano passed through a period of evolution and development, levelling off at about 1890 when most of the development ceased. Of course there continues to be refinements since that time, but nothing as major as during the 19th century. Chief among the items to be developed was the use of cast iron to help hold back the tension applied by the strings. Early pianos had only wood frames, but by 1830 iron bars and plates were introduced, and by the mid-1800s a full cast plate was common. 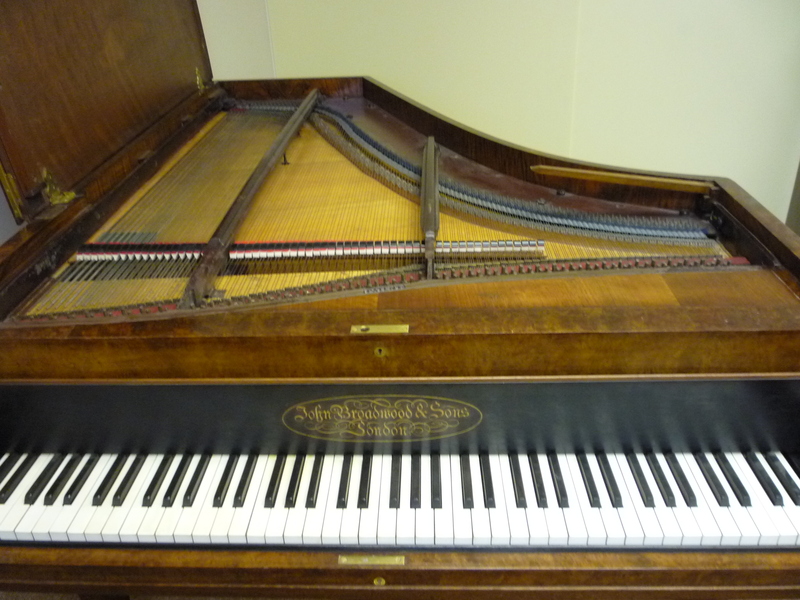 This piano has a sectional plate comprising a full tailpiece for all the hitch pins and front plate covering the pinblock and around the tuning pins, plus bars running parallel to the strings connecting the two plates. This was called a “bolted iron frame”, and was Broadwoods’ norm until 1895 when they included full one-piece castings on their pianos. In this model the cast iron components are all painted dark brown. 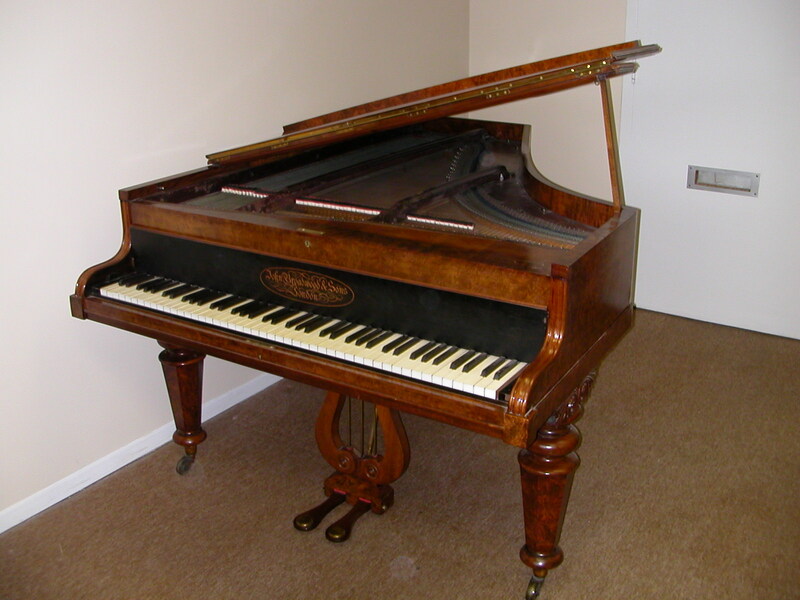 Broadwood had a vast output of pianos and often featured fancy veneers and carvings. Their woodworkers had access to the finest woods brought from around the world at the height of the British Empire, including species of woods now in peril or banned from harvesting. This individual features a fancy bur walnut case and hexagonal legs, with ebony facing around the keys. The keyboard is finished in ivory and ebony, 100% original and in excellent condition. The case overall is french polished and all veneer is in almost-perfect condition. 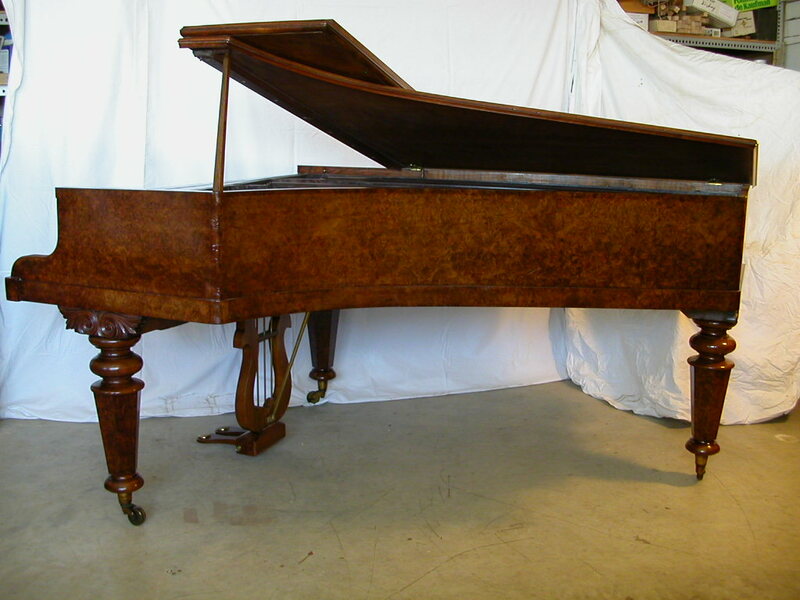 The top view shows how straight-strung pianos usually have a narrower tail, almost like that of the harpsichord, as opposed to the more rounded and broader over-strung pianos. Details of the ebony surrounding the keys, and fancy legs and pedal lyre.